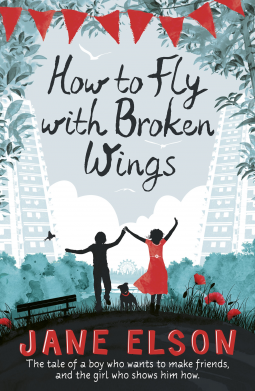 Today I am reviewing 'How to Fly with Broken Wings' by Jane Elson. Twelve-year-old Willem has Aspergers Syndrome and two main aims in life: to fly and to make at least two friends of his own age. But all the other boys from the Beckham Estate do is make him jump off things. First his desk - and now the wall. As his toes teeter on the edge, Sasha Barton gives him a tiny little wink. Might she become his friend? Unlike previous reviews I am going to start with my rating which is 2/5. Now I didn't hate the book I just think that there were a lot of things wrong with the book. Though I am going to start with the positives. I loved the characters, I thought they were all quite realistic and that she did a great job with portraying autism. Out of all the books I have read with autistic main characters, this captured the actuality of it best. I loved the first 14 chapters and the writing style. Now onto the things I didn't like. My first problem is a problem that I have with a lot of books from younger protagonists. 12 YEAR OLDS AREN'T THAT YOUNG. By the age of twelve I had been through quite a lot (I won't bore you with the specifics) I hate how author make it seem like 12 year olds are clueless, as if they don't know what is going on in the world. Authors please stop doing this. My second problem was that I felt the author had written the first 40% of the book and realised it was to short so added an extra 60% that we didn't really need. I found that at point I was forcing my self to finish to book and it wasn't because the writing was bad it was just that the story kinda of lost its storyline. My third problem was the storyline was kinda confusing like I could've sworn that Finn got put in prison three times. My final reason is I think that the author is going for the wrong audience I can imagine this being a 9 year olds favourite book. So I think part of the reason I didn't enjoy this book as much as I had hoped was that it was to young for me. In all honesty although I have really ripped into this book and trust me I had to delete many sentences thinking that I was going to far, I didn't think it was that bad and I would recommend this book to people who have younger children or who are in the young adult bracket and want to just have a bit of a silly, slightly infuriating read.